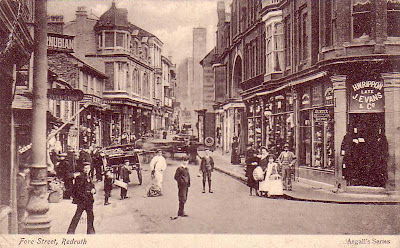 My grandfather was born in Redruth, Cornwall. When I told my mum that we were going to holiday there, she was envious as it's a place she's always longed to visit... to see the birthplace of her father. Of course she insisted that we couldn't pass up the opportunity to go and see/photograph/stand in the place where Grandad came from. 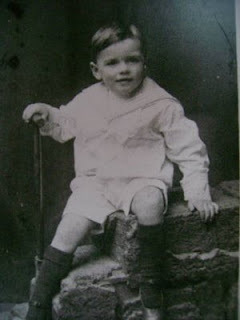 His parents (my great-grandparents) emigrated to New Zealand when Grandad was just two years old. Now, I am not really a family-tree/historical research kind of gal. I find it interesting but not hugely so. I know mum was a little disappointed at my lack of enthusiasm, but I promised we would try to find the house: A large historical home called Pednandrea, near a landmark mining chimney. I imagined a smallish village with a couple of streets. I'd seen pictures of the house so didn't bother to check out the documents, maps and photos mum offered to give me. It's gotta be easy to find, right?? Well... on the day we headed to Lands End we went via Redruth. Imagine my shock when it turned out to be quite a large industrial town. How on earth was I meant to find grandad's house in this place?? 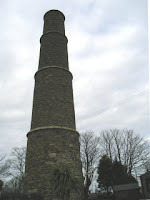 Winnie (ma-in-law) suggested the library, and we were on our way there when I spied in the distance: the Mining Chimney! I knew I'd seen it all my life in photos and that the house couldn't be far. It gave me a queer shiver and I found myself getting quite excited. After all, the fact that Grandad was from here, meant that I am part Cornish! And it's such a lovely place, surely I would be pretty cold to not feel some pride in my heritage? The libraria n confirmed the name of the mining chimney was the Pednandrea Stack, and gave us directions to the house - we were just around the corner! There was a sign on the gate, we drove in and found... a strange house. Not the one I remembered from the photos. It had been recently turned into 4 flats, painted, and sold. We queried a workman, was this the only Pednandrea House?? Well, said Winnie, this has got to be it, Pet. There's only one Pednandrea House. It's probably just changed over the years. Probably painted a different colour. That's why you don't recognise it. So we took some photos, I posed by the sign and we left. I felt strangely empty. Was that it??? A week later when I had access to the internet again, I decided to do some checking. Why did my Grandad's parents emigrate to NZ (a raw pioneering outpost back in the early 20th century) when they must have been very well off if they were living in such a house? And when Cornwall was such a lovely spot? I think I'll have to do some more digging, learn a bit more about my great-grandparents who emigrated. I think there's a mystery there. ...for the house in my mum's family photos. The map put it right around the corner from the one we had visited. Apparently it's called Pednandrea Count House. 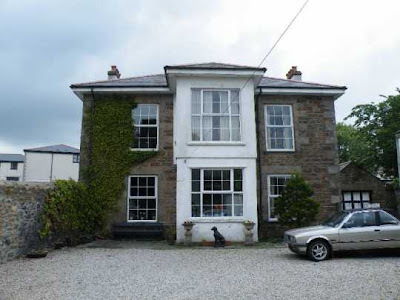 I have photos of the wrong blinkin house! Arrrggghhh!! So near and yet so far. Bummer. I am so gutted. Yes, how annoying that would have been, to be so close, yet so far. Felt your chagrin.